Since last couple of weeks of August 2017 were terrorized by Harvey, it is difficult to say whether the August numbers are worth anything. They data is obviously skewed, as very market came to a screeching halt during those wet and rainy weeks. Regardless, you will find those numbers listed below and they are obviously much improved. According to the latest report from the Houston Association of Realtors (HAR), single-family home sales in August 2018 increased 37.2 percent compared to August 2017, with 8,358 homes sold in August versus 6,090 one year earlier when Harvey came to our lives. HAR isolated single-family home sales for the period of August 1 – 24 since Harvey’s effects began to take a toll on the market on August 25, 2017. That analysis showed sales up 7.6 percent in August 2018, with 5,844 homes sold through August 24 of this year compared to 5,433 during the same time frame last year. The single-family home median price rose 3 percent to $236,870. The average price rose to 1.9 percent to $300,670. Both represent the highest figures ever for an August. According to the Houston Association of Realtors, the 41,991 active listings in July 2018 represented a 36.8 percent increase from August 2017. Month-end pending sales for single-family homes totaled 8,084, a 43.9 percent increase over last year. Days on Market, or the number of days it took the average home to sell, was slightly down to 49 days versus 51 a year ago. Inventory registered a 4.1-months supply, down slightly from 4.3 months a year earlier. 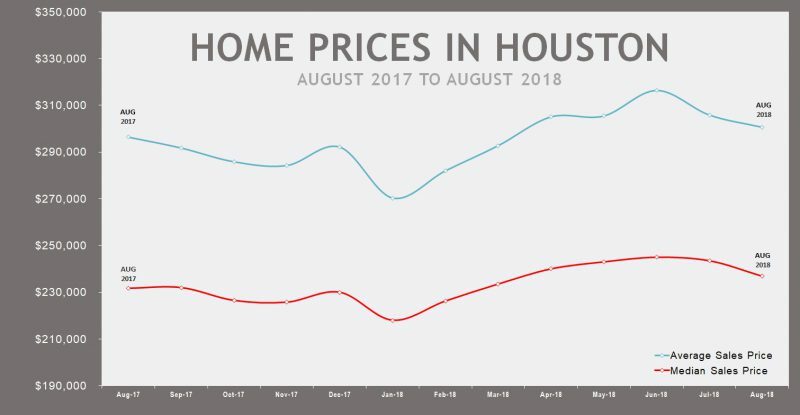 Anecdotally and by all accounts, the Houston real estate market appears to still be relatively strong compared to the previous two years of data. A strong national economy and strong oil prices continue to bring strength and stability of prices and demand. All things being equal, we anticipate this will continue for the remainder of the year.